Robots are part of the SF Bay Area food scene. Not the foodie scene. But definitely the food scene. Check out a scene on Telegraph Ave in Berkeley recently where a DoorDash robot at two feet tall was rolling the iconic street on its way to its next delivery, and it was so normal nobody much noticed. Robots being involved in our food in San Francisco has been around for a couple of years, and its growing, even though the robot technology is not that popular among the public. OpenTable did a recent survey of diners, with a whopping 70% against robots and automation in the restaurant and food service world. A report from McKinsey Global Institute states that the restaurant and hospitality sector in the U.S. is the fourth most automatable. So, locally, we’re seeing robots delivering meals, robot arms dolling out coffee, and lunch bowls being made by robots (at Eatsa). 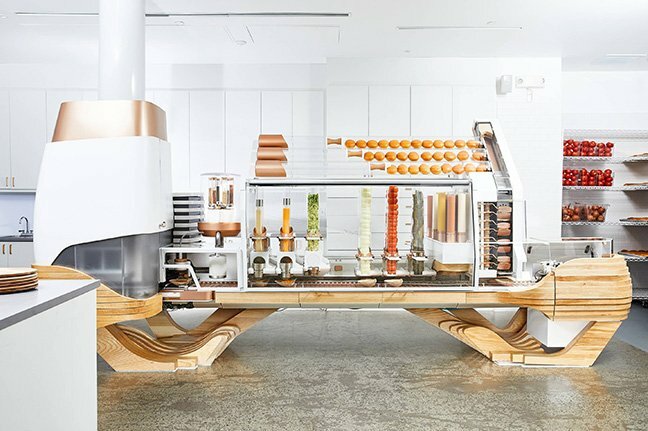 And on the ever-changing hamburger front, over at 680 Folsom St. there’s Creator’s which features a total robot prepared burger — from slicing and toasting the buns to grinding and cooking the burgers themselves and tossing on orders condiments. All for $6. The robot burger is so popular as a novelty that you have to buy a ticket online to go get yours, and they’re booked into the future.